An Ultra Orthodox Jew walks in front of a sign supporting Israeli Prime Minster Ariel Sharon outside Jerusalem`s Hadassah hospital. What do Moses, Charles de Gaulle and the American Confederate General Stonewall Jackson have in common? The answer is Prime Minister Ariel Sharon, who has been compared to all of them as Israelis confront an uncertain future since a severe stroke last Wednesday left him fighting for his life. From prayers in synagogues and tributes at soccer matches to postings on the internet, Israelis have shown an uncommon unity in their shock and sorrow at the fate of a man many had come to regard as their best hope for peace with the Palestinians. "In a sense, people will feel like orphans," said Moshe Lissak, Emeritus Professor of Sociology at Hebrew University in Jerusalem. "It is as if their father died." It was not always thus for Mr Sharon, the last great figure of the "warrior generation" that forged Israel's existence in battle with Arab armies in 1948 and a hugely controversial presence throughout its history. It is only since Mr Sharon, now 77, became Prime Minister in 2001, seven months into a Palestinian uprising, that the headstrong former general gradually assumed the mantle of peacemaker. Public attitudes changed as Mr Sharon changed, defying many of his supporters in a radical U-turn to remove Jewish settlers and Israeli troops from the Gaza Strip in September after 38 years of occupation. "When Sharon was elected, some people were horrified. They thought it was the greatest disaster in Israeli history," said Avner Falk, a clinical psychologist who writes psychoanalytical biographies of prominent figures in Israeli and Jewish history. He said Mr Sharon's conversion had come about only because as Prime Minister he had no one above him following a lifetime of defying higher authorities starting with his father. Now "if he dies or if he disappears from the scene, he will be revered and remembered for only one thing - the withdrawal from Gaza," Dr Falk said. "This is his legacy and all the bad things will be forgotten." Even some of the settlers Mr Sharon ejected from Gaza talk of him with respect, a restraint Prof. Lissak said may reflect observance of Jewish laws that compassion must always be shown to the sick. 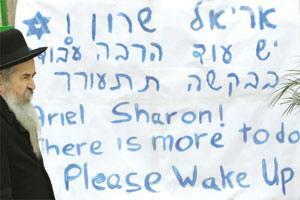 "The first time Mr Sharon was a hero for me was in the army, and I am very sad with his situation now. I hope he feels better and his family gets him back," said Gaza evacuee Arik Harpaz. Prof. Lissak, Dr Falk and others attribute the widespread sense of loss among Israelis since Mr Sharon was admitted to Hadassah Hospital to a psychological thirst for a protector and champion. They and others say it derives from a Jewish history of persecution culminating in the Holocaust and Israel's desire for a normal existence in a Middle East where it is still technically at war with some of its Arab neighbours. The uncertainty also reflects a lack of clarity over how the Kadima party Mr Sharon founded on his path from conservative to centrist might translate his imprecise plan for further territorial concessions in the occupied West Bank. "Everyone knew that (Gaza) was only the first step," Prof. Lissak said. "But Sharon didn't leave any real programme. No one knew exactly what his next step would be." Since Mr Sharon's illness, comparisons have flooded in - with the dominant figures of Israeli history like founding father David Ben-Gurion, with the warrior heroes of Judaism and with foreign luminaries such as the general-turned-president Charles de Gaulle of France. One comment on a blogsite, http://balagan.blogspot.com, dubbed Sharon Israel's Stonewall Jackson, a Confederate general of the American Civil War renowned for his military prowess. As a soldier Mr Sharon was a hero of the 1967 and 1973 Middle East wars but was almost cashiered for insubordination and used ruthless force against Arabs that alarmed some of his superiors. He took Israel into its longest and costliest war as defence minister with the invasion of Lebanon in 1982 and an official Israeli inquiry found him "indirectly responsible" for the massacre of hundreds of Palestinians by Lebanese Christian militias in the Sabra and Shatila refugee camps. As a politician, both in opposition and as a Cabinet minister, he was the architect of the settlement of Jews on occupied land and earned the nickname "The Bulldozer" as much for his forceful style as for his formidable girth. "Even the sheep are afraid of me," he told Time magazine in an interview on his farm in southern Israel in 2000. Uri Avnery, a peace activist who has often likened Mr Sharon to Napoleon, now also compares him to Moses, who glimpsed the Promised Land only to die before he could set foot on its soil. His legacy was largely 'myth', Mr Avnery wrote at the weekend, generated by Israelis on the left who had projected onto him their own longing for an end to conflict with the Palestinians. Yet, Mr Avnery said, the myth could become a blessing if the March 28 election Mr Sharon had been tipped to win led to a governing majority in favour of a Palestinian state.